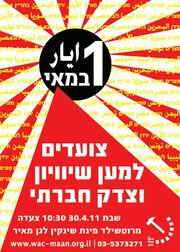 Gathering in Tel Aviv, farm workers and construction workers from throughout the country, as well as college teachers, truck drivers and waitresses—all organized in our trade union, WAC-MAAN- will join their voices to the call, shouting: “Away with the dictatorship of capital! Yes to equality! Yes to social justice!” From the heart of Tel Aviv, we applaud the turn to democracy now taking place in Egypt and Tunisia, and we declare our full support for the Syrian people in its fight for freedom. The government of Israel frets anxiously over the fall of the dictatorships, which it has supported, covertly and overtly, for more than forty years. The Arab democratic revolution confronts Israel with the challenge of ending the Occupation, dismantling the settlements and joining the historical journey toward justice. The Israel of today is a state without pity, a state of tycoons, a state of enormous social gaps, where a million workers (a third of the labor force) earn the minimum wage, where even the social workers have had to strike because they don’t earn enough to make ends meet, while the bankers and managers rake in millions. In commemorating the First of May this year, we shall demonstrate for a fair wage to every worker, against all forms of discrimination, for equality to Arab workers, against unemployment, against the revolving door policy that enslaves migrant workers, against the damage that is now being done in education, health services and social welfare. We call on every worker to join us, because only by organizing will we be able to change our lives! Asma Agbarieh-Zahalka who wrote extensively about the Arab revolutions and who is in close contact with both the Egyptian and Palestinian union and youth activists.